Does anyone have any experience with a Peavey Session 400 Limited as a steel amp? I wanted to get some feedback on how the limited performs as a steel amp? I think the reason they weren't too popular is because of it's brittle tone characteristics. It's a tough one to dial in. I have a few different amps. I put the upgrade IC chips in the limited, but it didn't help a lot. I've managed to get a descent tone out of it, but only if I use it with a JBL D-130F speaker. It's my practice amp. I'm sure I could use it on a job if I eq'd it with my Fuhrman PQ-3. My 1974 Session 400 is much fatter and softer highs. 1976 Birdseye U-12 MSA with Telonics 427 pickup, 1982 U-12 Zum with Truetone pickup wound 18K, Revelation Preamp, TC Electronic M-350 Processor, Carvin HT 400 Stereo Rack Head, 15" Eminence EPS-15C, ShoBud Pedal, 1949 Epiphone D-8. And, too much extra gear. The 400 Limited is designed as a steel guitar amp with a 15" Black Widow steel guitar speaker, but as Peavey's line of steel guitar amps go, this one is considered by many players to be the least desirable. Posted 7 Feb 2019 5:54 pm Nothing Wrong with a Session 400 Limited. I use mine for high power gigs, outside, big venues, and have never had a problem with the tone. I would like to find an old LTD, just to have a smaller footprint on stage. I always carry an extra amp for guitar when using the Peavey. 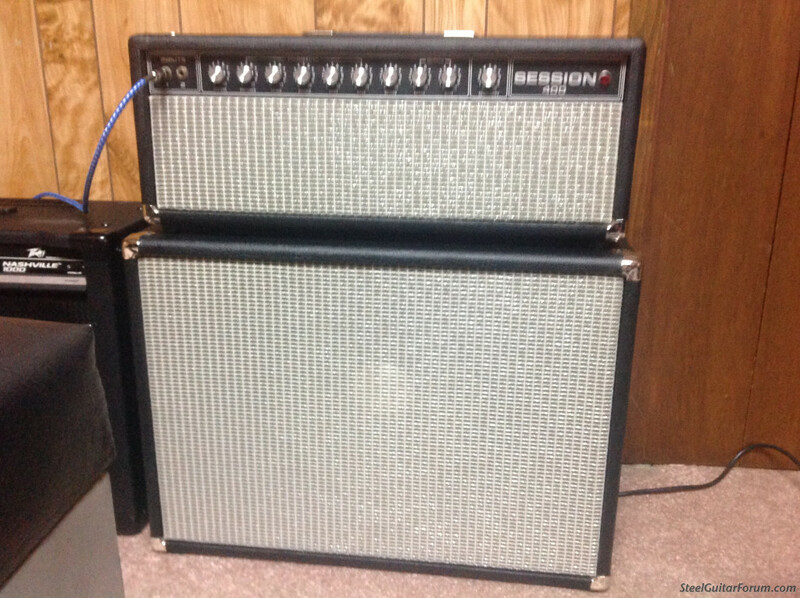 If I only have room for one amp, the Fender amps (Twin, Pro Reverb, Deluxe Reverb) gets the call. I had one for several years. Aside from being heavy it was dry sounding regardless of the settings. I had a chip mod job done and that made very little difference so I sold the thing. I guess it depends on what sound you're going for. I look for sweet, musical sounding amps that have warmth without sacrificing crispness and transparency. The Session Limited didn't do it for me at all. From where I sit, the Session 400 was/is the "heralded" the golden icon by pro players and weekenders such as myself. I do own one and play through it on live gigs. None better sounding. However, there are newer amplifiers that sound as good, as we steel players are always seeking that "elusive" tone. Short of the original Session 400, I don't believe that any company has caught it yet, but we sure try. I've worked with pro's and weekenders alike, and all remember the Session 400 as being the "one". However, as time goes by and technology changes, our hearing changes, the original Session will always be remembered. Mike, it looks like the OP is referring to the Session 400 Limited rather than the Session 400. I've never had a chance to use a Session 400 but I've heard nothing but good about them from players whose opinion I trust. The Session 400 Limited is a different animal altogether as you certainly know. It doesn't have the same electronics, sound or reputation. I'm not anti-Peavey. I've had two Nashville 112s which I really like. Some day I hope to pick up an old Session 400 in good shape as well. The Session 400 Limited is much different than the original Session 400. This one has the JBL D 130 and sounds really good. I also have a Session 400 Limited which I've done the chip upgrade and I've changed the speaker to. Neo. Sounds pretty good as well and lots of power! Much too heavy to be a gigging amp. I think I'm going to build a cab for the amp and speaker and try to sell.